Eclipse IRT serves as a platform for our extensible web application suite. IRT seamlessly integrates with other technology solutions, like Electronic Data Capture (EDC), to allow you to easily inform data management teams to updates in your clinical trial. 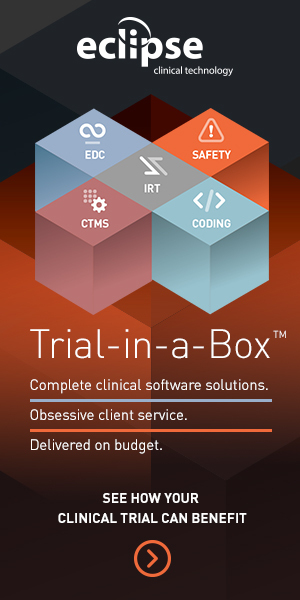 Manage randomization, subject enrollment and drug supply management in any clinical trial. It also saves you time and money. With IRT, many of the tasks and responsibilities that were performed over the phone, fax or with paper may now be conducted via the web. This provides sponsors with the flexibility to collect information 24×7, consistently and accurately. The integration with other clinical software ranks eclipse IRT above other interactive response technologies. Enrolling study subjects, randomizing and managing drug supply is crucial to the success of clinical trials, regardless of phase. In today’s Internet-savvy world, Interactive Web Response Systems (IWRS) are quickly replacing outdated, time consuming voice response systems. Eclipse Interactive Response Technology and integrated EDC functionality enables continuous reconciliation to occur. This minimizes the need for clinical data management to conduct additional external reconciliation. Sites rave about the ability to completely replace IVRS with the less costly and more efficient Web-based option. Eclipse IRT automated randomization systems use the latest statistical methods, clinical programming and validation procedures. This ensures quick, accurate patient assignments and balanced and valid subject assignments within electronic data management. The IRT functionality completely manages the supply chain from shipment to re-supply, ensuring proper kit numbers and monitoring of defective or damaged supplies. For Sponsors using Just In Time (JIT) methods of controlling inventory, the IWR web-based solution has adequate supply sent to sites from depots throughout the drug supply chain. This key function reduces human error that’s common to traditional IVRS, paper-based methods and other interactive response technologies. Visit Knowledge Central to learn how Right Now distribution reduced all categories of waste, when compared to traditional models. Our webinar, Implementing Drug Pooling Through Technology, may be viewed online here. Learn more about simplifying randomization, subject enrollment and drug supply management with eclipse Interactive Response Technology. There are many factors in choosing a new IRT system and we talked about quite a few of them here. If you would like to explore your IRT software options further please schedule a consultation with one of our IRT experts.